These Cheddar Jalapeno Poppers with Sausage stuffed with cream cheese, cilantro, and nutty aged cheddar cheese are a great game day snack. I took a little different spin from your traditional jalapeño popper recipe and made the filling with mild sausage, cream cheese and cilantro and then added Kerrygold Aged Cheddar Cheese for some nutty flavor. You won’t believe how tasty this combination is! Simply fill the jalapeño halves and then sprinkle a little more cheese on top. Another bonus: You can assemble these ahead of time and refrigerate until time to bake. But these poppers definitely taste best when freshly baked. Thank goodness I never have leftovers! Use a small spoon to scrape out the insides of the pepper. The heat of the jalapeño is in the ribs and the seeds. Removing both of theses will make these snacks VERY mild. 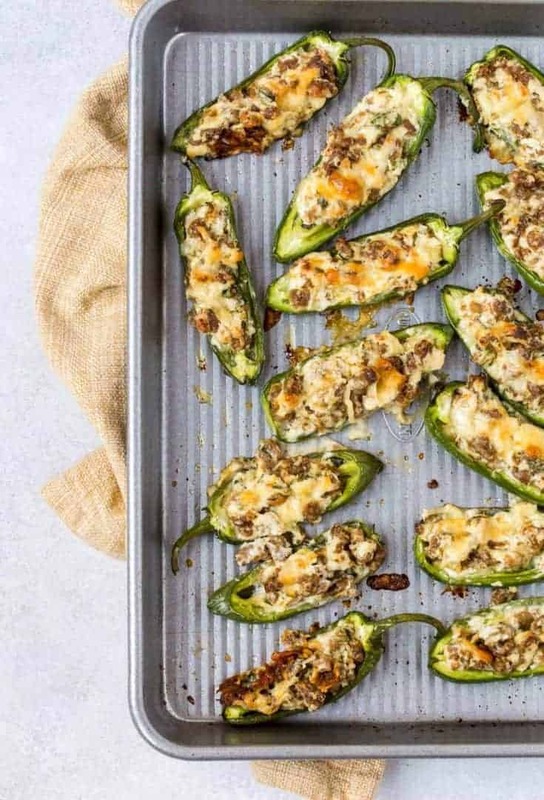 Don’t get me wrong; if you want to make these Cheddar Jalapeño Poppers spicy, you easily can. Simply leave some ribs of the jalapeño intact or throw in a few seeds. Just make sure your friends are on the same page! Looking for some more ways to add some heat to your party spread? 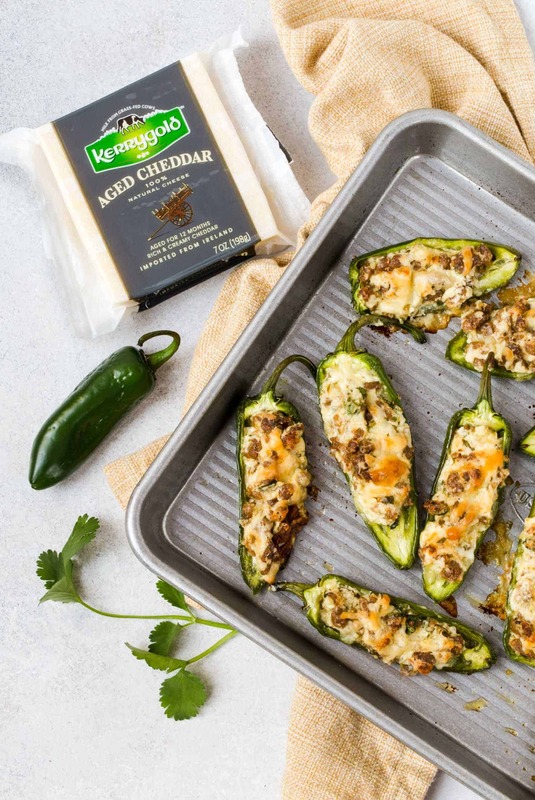 Sprinkle a few shreds of Kerrygold® Aged Cheddar cheese on top of each pepper and bake for 25 minutes. Oh yes: game day, any day is perfect to make it. Pure pleasure ! Thank you ! Thanks so much for sharing this awesome recipe! We are going to try these later this week, and they’re going to be a huge hit!! Enjoy!! They are one of our favorites!